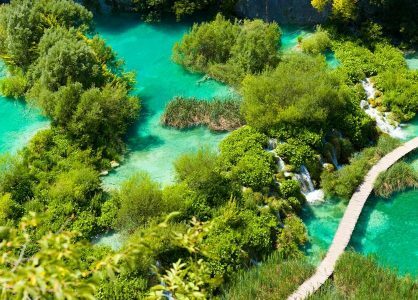 We highly recommend a day trip to explore whilst you’re in Croatia. We often organise a stay for our clients whilst they are on a twin or multi-centre holiday in Croatia. The magnificent National Park is set in 300sqkm of forest conservation. The popular destination was awarded inclusion on the UNESCO World Heritage register 1979. It features sixteen lakes that are interconnected by a series of cascading waterfalls, and surrounded by wonderful scenic woodlands that are home to deer, bears, wolves and rare birds. The peak summer months of July and August are guaranteed to very busy and very hot. September is a good time to go as crowds thin out with the end of the summer holidays, and temperatures cool down. Restaurants and cafés should still be open. Autumn, Winter and Spring in the park reward you with incredible changing colours as well as fewer crowds. Some walkways are closed off though, because they can become dangerously slippery when icy. Some cafés and bars also close and menu options will be reduced until the peak season. 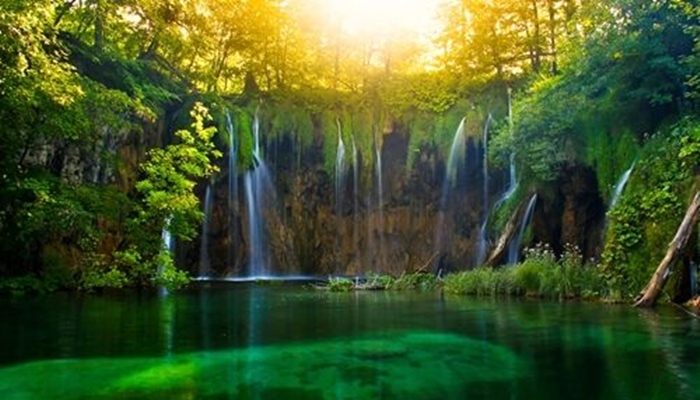 Plitvice Lakes National Park is situated halfway between the cities of Zagreb and Zadar. If you’re planning a day trip, our team of travel experts will organise a private transfer from either city, depending on which is most convenient. The car journey will take around one hour. The 7 Kuna car entry to the park will be paid for you in advance. Whilst a day is sufficient to see the Park, we also recommend an overnight stay in our preferred four-star hotel. Waking up in such beautiful surroundings is often appreciated by those looking for a real escape from busy lives at home. 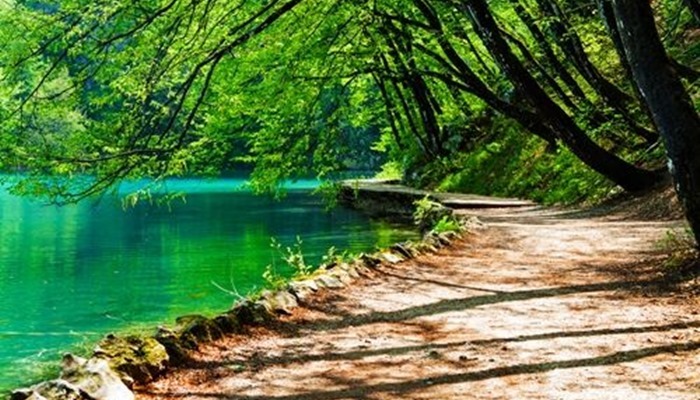 Plitvice Lakes National Park is open all year round from 7am to 8pm daily. We suggest arriving early in the morning and taking the train to the highest point in the park. Spend the morning descending through wild flower meadows, oak forests and lakes. Cross the lakes as often as you like via wooden pathways which hover above the surface of the water. From these walkways, you will come across truly breath-taking views of cascading waterfalls. Take a picnic lunch and set up camp in your own little patch of paradise. Alternatively, you can have lunch at an onsite café. In the afternoon, take a boat trip on one of the lakes. The ticket is included in your entry fee. Swimming is prohibited to protect the area. 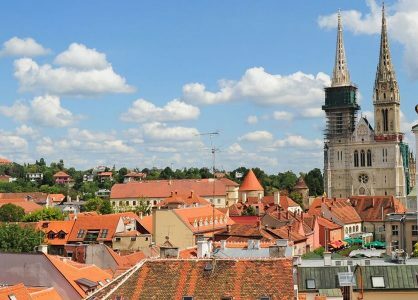 If you are going to the Park on a day trip from Zagreb or Zadar, we will pre-pay your entry for you. If you are staying at one of our recommended nearby hotels, you will organise entry yourself. Cheaper tickets are available for children aged 7 to 18, and those under the age of 7 go free. If you are a student, or travelling to the park in a group of 15 or more people, you can also get a discount on the entrance fee. Buying a two-day ticket for the Park will save you money. If you want to book a four-hour guided tour in English, German, French, Spanish, Italian or Croatian, this can be pre-booked (for a minimum of 15 people) at an additional cost. The entrance fee money goes towards the cost of maintaining the lakes, so that everyone can enjoy the amazing back to nature experience.